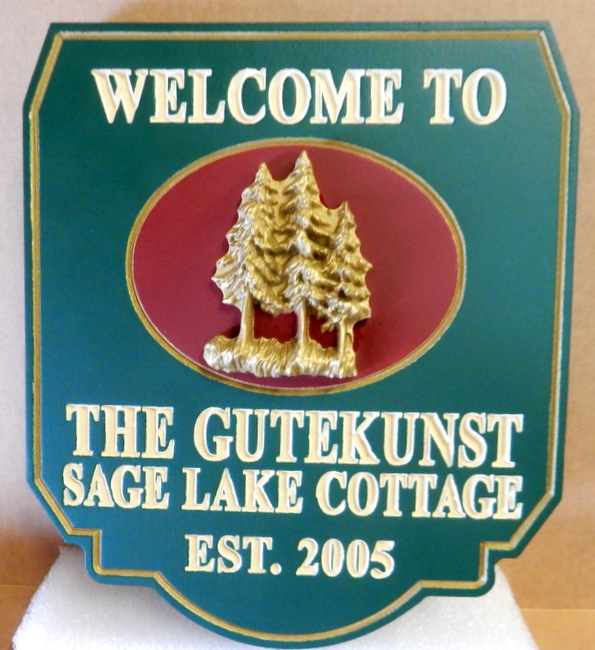 This beautiful Sage Lake Cottage sign for the Gutekunst family has text engraved (V-carved) in the border and a 3-D bas-relief carving of a group of pine trees., raised above the red background. The red and green are painted, and the text, border and trees are gilded with 24K gold-leaf.The entire sign is clear-coated twice for additional protection against UV radiation, rain and snow. The sign can be mounted on a wall or fence, on a post or between two posts, or hung from a wood or iron hanger from the eye-hooks on the top.